Subtlety has never been one of TopCar’s most enduring characteristics and over the years that it’s been active, the Russian tuner has never once apologized for it. Not that it needs to because we all need a little dose of mental from time to time. This brings us of course to TopCar’s latest piece of work, a new tuning program for the range-topping Porsche 911 Turbo S called the Stinger GTR Gen.2. 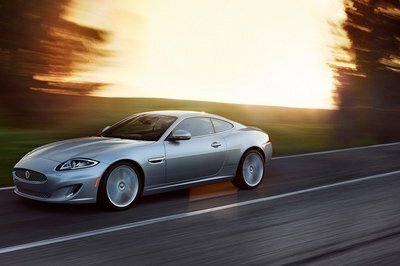 Oh, and it packs a scintillating 750 horsepower – 170 ponies more than the sports car’s standard output of 580 horses. The power surge is the obvious highlight of the kit, but it’s not the only one that’s worth the hard-earned money of 911 Turbo S owners. The Russian tuner also added a bespoke body kit that essentially transforms the Turbo S into something that looks more like the 911 GT3 RS. 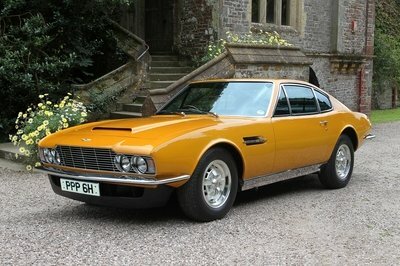 That was TopCar’s objective from the onset and from how those glam shots of the sports car look, it appears that the tuner really had to do some serious work on getting the look it desired. The 911 Turbo S Stinger GTR Gen.2 just made its debut at the 2016 Moscow International Motor Show and by TopCar’s own admission, it’s one of the most “complicated projects” it has ever built. It’s hard to argue against that claim given the complex and sophisticated finished product that we’re all looking at. Is it the best tuning program available for the 911 Turbo S? That’s still debatable. But at the very least, it’s certainly one of the most eye-catching we’ve seen in a long time. As impressive as the engine upgrade is, a case can be made that the exterior upgrades are the real highlight of TopCar’s Stinger GTR Gen.2 program for the 911 Turbo S. Odd as that sounds, there’s also some truth to it, thanks in large part to the significant addition of carbon fiber components throughout the sports car’s body. 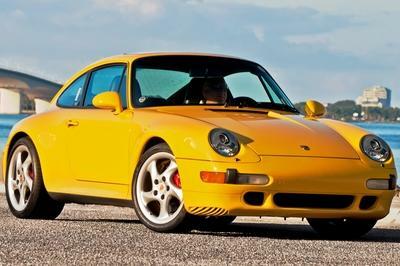 For instance, the standard front fenders have been taken out completely and replaced with a carbon fiber version that comes with its own GT3 RS-style ducts. Both bumpers and the side skirts of the 911 Turbo S were also treated to the same modification and the front bumper, in particular, now carries stabilizers in the middle and are flanked by new side air ducts. On the opposite side, the rear fenders were modified using carboxylic linings while the rear bumper also gets extra side air ducts. A new rear wing and a bit sport diffuser are two more key additions to the 911 Turbo S’s aerodynamic makeup, helping improve the sports car’s downforce to complement the significant upgrades made to the car’s 3.8-liter turbocharged flat-six engine. Concluding the exterior modifications is a new set of ultra-light ADV.1 wheels and a noticeable amount of TopCar badging, just in case people start asking which tuner was responsible for this work of art. Proving how extensive this program is, TopCar is also offering personalized upgrades to the interior of the 911 Turbo S. These modifications will vary depending on the taste of the customer and the budget allocated for this specific section. Given the overall complexity of the program, it’s not surprising that TopCar chose to keep the details of the engine upgrade on the down-low. That, or the company will only discuss it to potential customers. 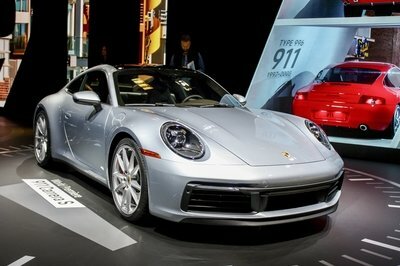 Either way, the tuner claims that it can get 750 horsepower out of the 911 Turbo S’ twin-turbo flat-six. 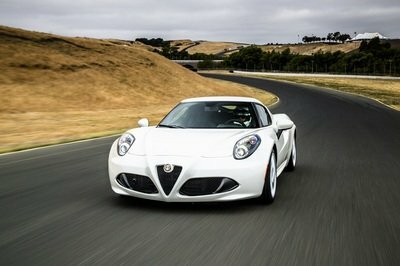 That’s a hefty increase from the stock 580-horsepower output of the sports car. No details were shared on the accompanying increase in torque numbers, but considering the extra horses it was able to get, the Topcar-tuned 911 Turbo S could have the power to slash its 0-to-60-mph sprint time to an incredible 2.6 seconds to go with a massive improvement in top speed amounting to around 217 mph. 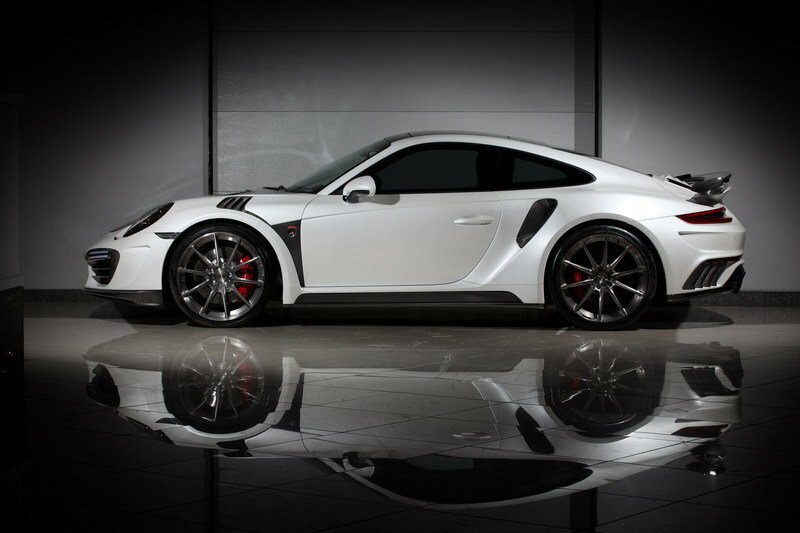 That, boys and girls, is how you turn a Porsche 911 Turbo S into a certified supercar. The Russian tuner didn’t dive deep into the upgrades in this section, although it did say that it "can install a more advanced brake system" should a customer ask for it. The tuner has yet to publicly state the pricing details of the program, but don’t hold your breath waiting for it. There’s a lot of personalization attached to this kit so prices could vary depending on the customer. 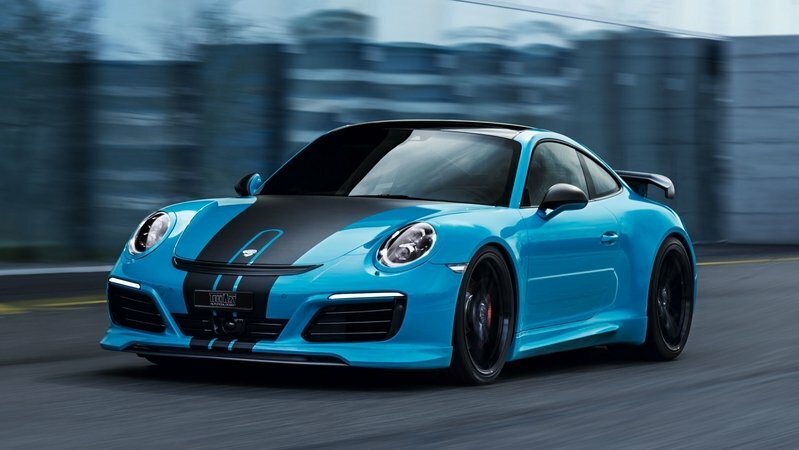 The best way to go about it is to contact TopCar directly to get a price quote on what you’d like the tuner to do to your 911 Turbo S.
TechArt isn’t particularly known for developing over-the-top programs that turn cars into rockets on four wheels. The German tuner is more conservative on that approach and that’s what we see with its program for the Porsche 911 Turbo S that it unveiled back in June 2016. There are a bevy of exterior and interior programs attached to the kit, but the real highlight is the tuner’s Techtronic management software that’s earmarked specifically for the 911’s engine management unit. When installed, the module adds an extra 60 horses and 96 pound-feet of twist to the 911 Turbo S’s output, bringing the total number to 640 horsepower and 649 pound-feet of torque. That results in a 0-to-60-mph time of of just 2.7 seconds to go with a new top speed of 210 mph. This is a relatively older program but given the tuner involved – edo competition – it’s worth bringing up when lining up a competing program to TopCar’s new kit for the 911 Turbo S. Like TechArt, the improvements aren’t significant to give the 911 Turbo S supercar-like capabilities. But it’s still good for 590 horsepower and 575 pound-feet of torque, enough to drop the car’s sprint time to 60 mph to just 2.8 seconds and increase the top speed in the neighborhood of 210 mph. I’ve always been a fan of TopCar’s tuning credentials, especially when it comes to models wearing Stuttgart’s coat of arms. It’s nice to see that for as long as Topcar has been around, it hasn’t lost it’s tuning touch. 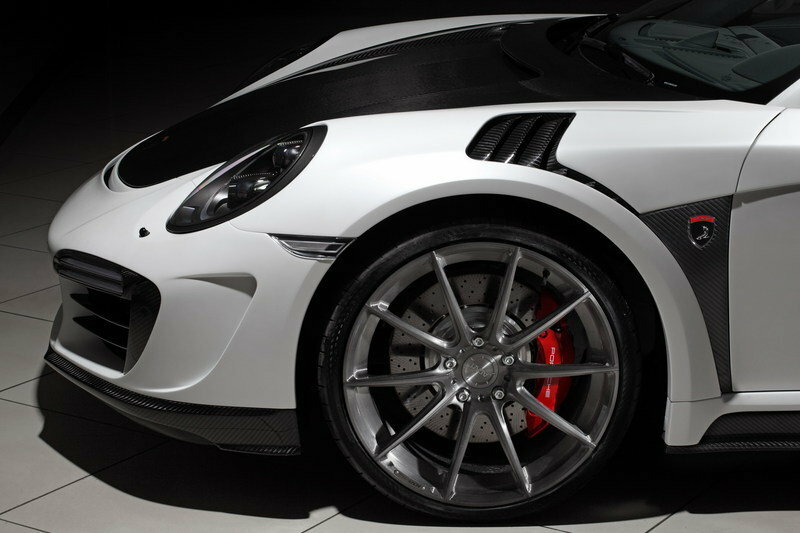 The Stinger GTR Gen.2 program is the kind of upgrade you’re going to need if you want your Porsche 911 Turbo S to really stand out from the crowd. 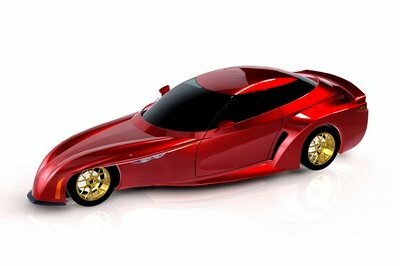 It looks incredible visually and from what the tuner has promised, that 750-horsepower output is just as mouth-watering. 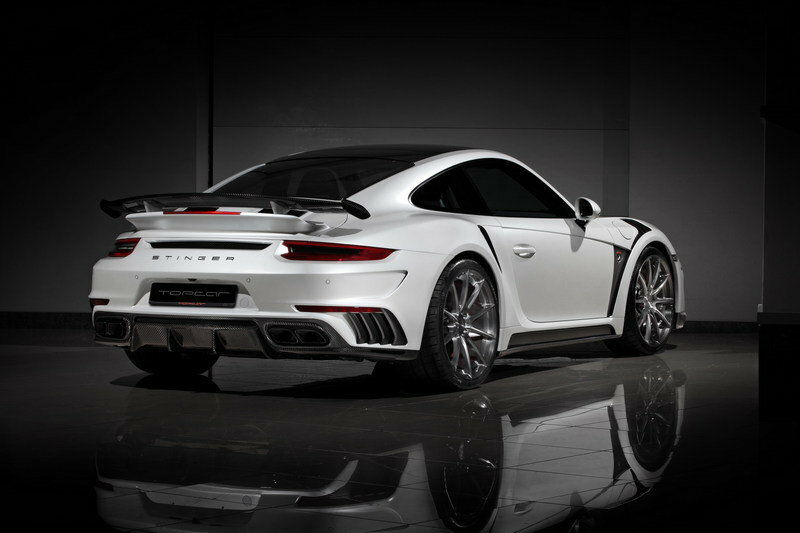 750 horsepower on a 911 Turbo S? Sign us up!